Recorded, mixed & produced by Phi, with original artwork by Laurie Monk. Tracks 1,3 & 5 written by L. Larsson, tracks 2 & 4 written by R. Munerel and track 5 written by Larsson/Yaan-Zek. 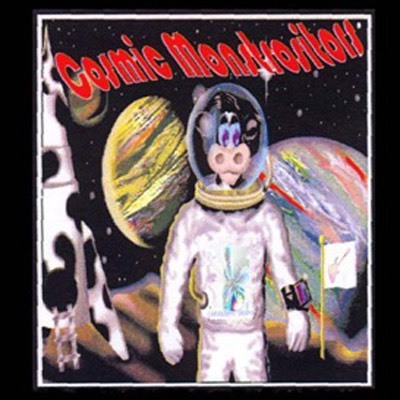 The Cosmic Monstrositors (as named by Todd Duane) was recorded mainly at the American Institute of Music school in Vienna between 1991 and 1993 on a portable Fostex 4 track recorder with no budget at all. The project was basically an MVP-inspired (i.e. Mark Varney Project) raw shredfest over quirky fusion grooves, and was simply a fun opportunity to get some friends together to play some unashamedly wild and freaky guitar solos. Regardless of the very basic production it was good to have recorded with such great guitarists as Milan Polak, Mario Parga, Todd Duane and Dave Kilminster. Collectively their amazing guitar performances still have that big 'wow' factor all these years later!